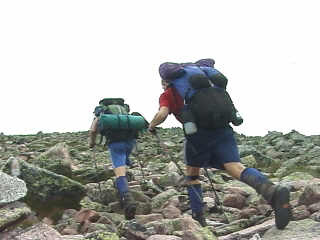 Up until now, the only video I had ever seen about hiking the AT was "North to Katahdin" by Thomas Hogeboom. That film is great, but it is a little dated and is a little limited by the equipment that was available at the time. So here we are in the 21st Century. Technology has made it easier to get out and shoot video, Thru-Hiking is more popular than ever, and the time is right for someone to get out there and capture the experience of people hiking the AT. Heide Estes and Douglas Morse took on the obvious challenge. The video starts with hikers on the approach trail where the producer and director interview hikers starting up the trail. They move up the trail as we see familiar shelters and trail crossings where they meet more and more starting thru-hikers and a few section hikers. You get a chance to see them as some discuss their dream of thru-hiking, some with their problems (like an ornery dog), and some with their fading motivation. You get to see different characters from Chad (who eventually ties the whole movie together) to guys like Kentucky and Malice who must be the Cheech and Chong of the AT. In fact, there are so many characters that it would be almost impossible to list them all here. As the story progresses to New York and finally Maine, you get to see who is making it and who is not. Of those that make it, what has changed in them from their personal look to their outlook about the hike. You continue to meet many different personalities that populate the trail, with some new hikers mixed in. Some are the SOBOs that they are now crossing paths with, some are long time section hikers finishing their AT hikes, and some are new thru-hikers that started south that we never met before. More interesting stories and people telling their stories about what they have done and sometimes why. To end the video, the Producer and Director have followed up with some of the name of hikers we have met throughout the video, including some still photos, of what happened to them - when they finished the trail and other cool information about who got married and the like. It was a very nice way to finish off the video because by the end, you really wonder what has happened to some of these people. All through the video, there are cool shots of the background that makes the trail, but instead of glamorizing it, or paying a lot of attention to sweeping vista shots, most of the photography is right up, close, and realistic. The direction of "2000 Miles to Maine", as I see it, is to really focus on the people of the trail. Sure you see some good sights and some famous places; but the focus of the film is on who is hiking and their stories. You get a chance to see thru-hikers, section hikers finishing the trail, section hikers starting their 2000 mile quest, and everything in-between. If you are looking for a video on how to hike the AT, this will not be it. If you want a video about gear, this will not be it (although there is a list of one of the hikers gear here, with a short clip about it). If you want a video about anything technical, this will not be it. But if you want to see a video about people and hiking, this is the video. If you want to know what sorts of people are out there, get it. If you have never hiked before and plan to hike the AT, get the video and listen to the Preacher's rant. They were inspired by Bill Bryson's "A Walk in the Woods", but I feel they got a better and more accurate reflection of the people that are out there hiking the trail and who you will meet along the way. I highly recommend getting it if you love the AT, or especially if you plan to thru-hike, listen to the people that are doing it and see what they see and learn from what they are going through.